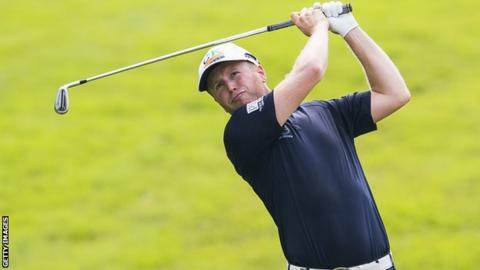 Bearsted golfer Matt Ford says retaining his European Tour card was an emotional moment. The 37-year-old tied for seventh place at the Hong Kong Open at the weekend, securing a top-110 finish in the Race to Dubai and his card for 2016. This year was Ford's first on the European Tour, having come through Qualifying School last year. "I was very emotional afterwards. It is hard to stop it when you have been pushing it back for so long," he said. Ford had started the week 118th in the Race to Dubai, and says he had doubts about whether he would be able to remain on the Tour. "I was always in a good position but the thoughts build as the week goes on," Ford told BBC Radio Kent. "You have to accept you are nervous and the mind will wander. It was heightened even more as you know what it means. "People asked me whether, on the 18th green, I knew what the scenario was and what I needed to do. "It was the last hole of the year so there was no comeback. I had to keep those thoughts at bay and focus on the single shot in front of me and that's what I'm most proud of." Ford's best result this year came when he finished second at the Africa Open in March, and he believes he can capitalise further in 2016. "I can pick and choose which events I play," he said. "I am pretty much guaranteed nearly all the big events and it is huge from that point. "My game is suited to certain courses so I can make sure I am ready for those tournaments."